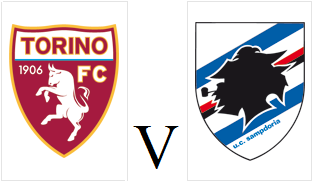 Torino will look to win their third game in succession when they welcome high-flying Sampdoria to the Stadio Olimpico on Sunday afternoon. Nikola Maksimovic misses out through injury, so he could be replaced in the Toro back line by either Pontus Jansson or Cesare Bovo. Bruno Peres is also back from suspension, but Cristian Molinaro may retain his place after a good display against Inter last weekend. Maxi Lopez, who was involved in Emiliano Moretti's memorable last minute winning goal could earn his first start for the club - after impressing in his three substitute appearances so far. Sampdoria have had an excellent season thus far and are currently in 5th position, and are only two points away from the final Champions League position. New signing Samuel Eto'o has been included in the squad and could make his debut for his new club.